Electric tool that is more powerful than a soldering iron; it uses finishing metal with a low melting point, such as lead, to join parts. Protective casing around the cable to lessen twisting and prevent wear. Part shaped like a pistol grip so the wrist remains straight while holding the tool. Electrical resistor that quickly heats the tip. Metal part forming the end of the gun, used to heat a solder. Metal wire that, by fusing over a joint, joins two parts. 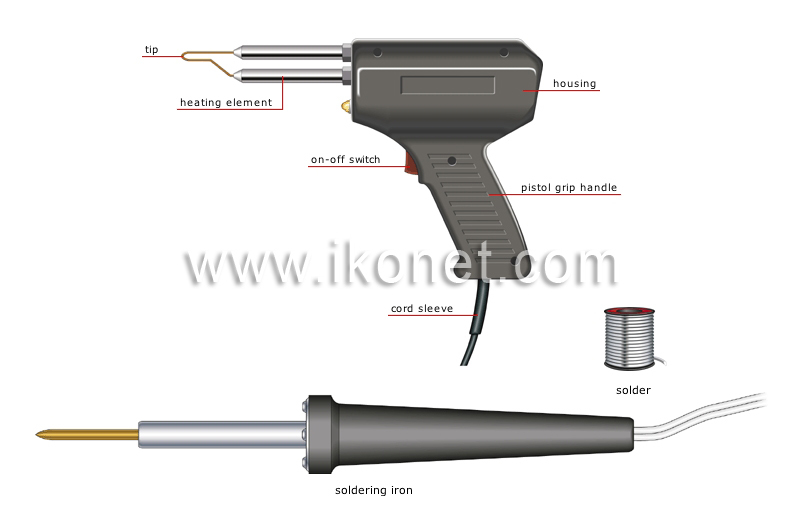 Electric tool with a tip for heating a solder, used to join parts that can take only weak mechanical pressure.